Start by choosing whether to practice place value or rounding of decimals. Then, in every trial, a problem will appear at the top of screen. If you click the correct answer - you get to add a new structure to your town. Answer 10 correct answers to advance to the next level. Every level unlocks exciting features. This is a beautiful game to practice and improve your decimal skills! There are 2 topics to practice: rounding and place value. 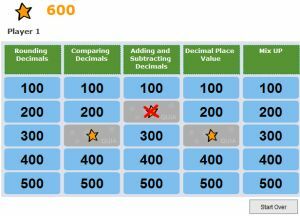 In the rounding option, you will be asked to round decimals to the nearest tenths or hundredths. 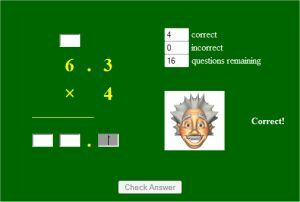 In the place value option, you will be asked to identify the digits of the decimals given. A decimal number will appear on the screen. You will be asked to click its tenths, hundredths or thousandths digit. 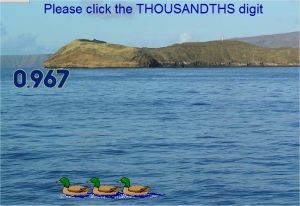 Click its correct decimal digit according to the sentence at the top, to collect all 10 ducks. Click on the correct digit of the decimal number, according to the sentence that appears above. Every correct click will send in a boat or a ship. Win the game by sending all 20 boats and ships. "In 3.5746 which digit is in the thousandths place?". Try to pass successfully maximum trials in the time given. 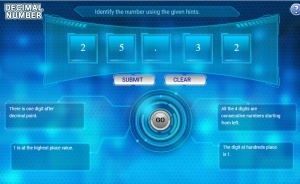 A sentence will appear on the top of the screen, describing a certain digit, for example "8 in the tenths place". Find the pirate that stands on a number that has that digit and click him. 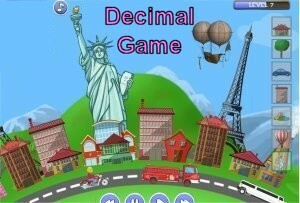 The game starts with numbers of 2 decimal places, and advances to more decimal places with every stage. After every guess, you will be told if the secret number is higher or lower than your number. It goes by stages, first you have to find the tenths digit, then the hundredths, and if you choose the hardest level, the thousandths too. 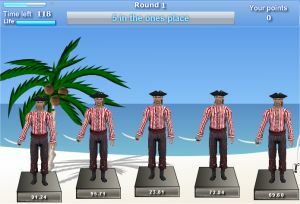 In this game the place value problems are presented in sentences. A row with digits appears above. Answer by clicking on the correct location to set the decimal point in the row of digits, this way you create the number which consists the right answer. After every answer you will get feedback whether you were correct or not. Round to the nearest tenths the decimal number that appears below. Click the spaceship that has the correct answer, and it will be sent on its way. Round to the nearest hundredths the decimal number given below. 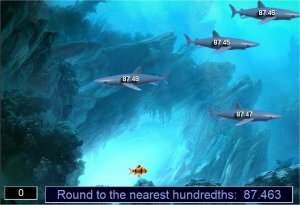 Find the shark with the correct answer and shoot it. Try to act quick - don't let the sharks eat the goldfish! 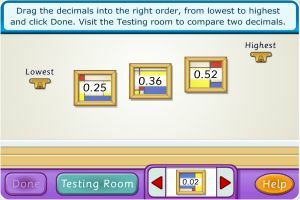 Drag the decimals from the bottom of the screen, and place them on the wall in ascending order, from left to right. It is possible to change the location of the decimals even after they were set on the wall, just drag them to the desired location. When you are finished, click the "Done" button. In the magic square, one number is missing. Type the missing number so each row, each column and each diagonal all add up to the same sum. Hint: use addition to sum rows or columns that the missing number is not a part of them. Then, use subtraction in a row or a column that the missing number is a part of. Every trial starts with a decimal addition problem. 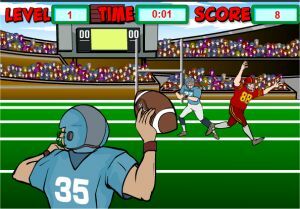 Click once to set the ball's location, and then another click to set the strength of your kick. Start by clicking the "Start" button, and an addition problem will appear. Solve the problem one step at a time, by typing the missing numbers in the highlighted boxes. When finished, click the "Check Answer" button, to receive feedback and get your score. After solving the addition problem, a subtraction problem will appear. This game can be played alone (one player game) or by competing with a friend. 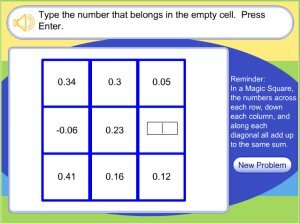 In every trial you choose a math decimal problem by clicking a number on the grid. The number represents how many points you will get for answering correctly. 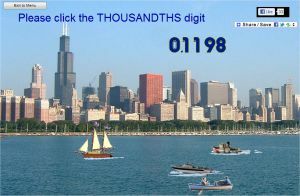 In this interactive decimal game you will get an increasing amount of money for every correct decimal problem you solve. You have a total of three hints you can use when you get stuck with a difficult problem. 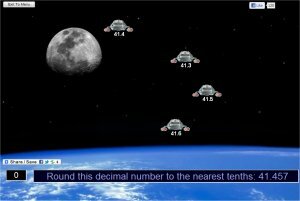 This game is similar to "space invaders" but with fractions and decimals. In every trial a simple fraction will appear on the lower left corner of the screen. Decimal aliens will be descending slowly from above. 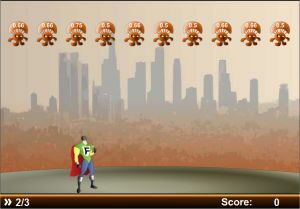 Find the alien with the decimal equivalent to the fraction given, and get your hero under it using the keyboard arrows. When you are in place, press the spacebar, to shoot a calculator and eliminate that alien. Don't let the aliens reach the ground. 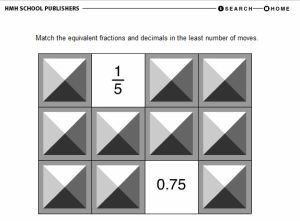 Pay attention, this is not an easy game, it starts with easy fractions, but as you progress through the levels, you get harder fractions (such as 7/9) and you need to act fast. This is similar to a matching memory game. Click two cards to reveal the fraction or decimal number that is hidden underneath it. If you find a matching pair - they will disappear and a part of the hidden picture will be revealed. Try to reveal the full hidden picture by finding all the matches. 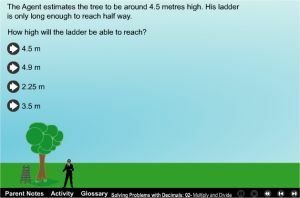 Help the secret agent gather his materials to build a tree house for his son, and calculate their costs. In every step you will get a decimal word problem, click the correct answer. In every trial you will get a math problem of a number with one decimal place multiplied with a one digit number (for example: 6.3 x 4). 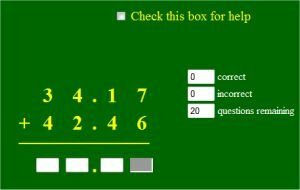 Answer the problem by typing it in the empty boxes, one digit at a time. You can get help by checking the "Check this box for help". It will assist you with solving the current step of the problem. Choose the right answers to the decimal math problems. The emphasis in these problems are in putting the decimal point in the exact location. 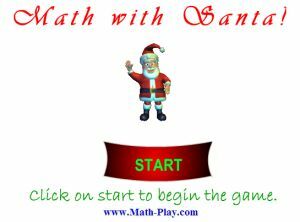 If you make a mistake, an animated Santa will appear and give you a hint of how to solve the problem. 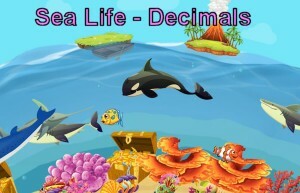 These games focus on the concept of the decimal and offer a vast array of different exercises for several specialized subjects, all presented in a fun and meaningful online learning environment. They combine lessons from basic arithmetic skills, such as adding, subtracting, dividing, and multiplying decimals. 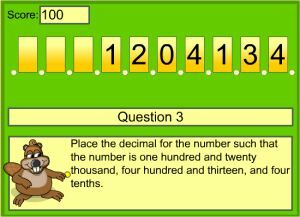 Children can also learn about place value and rounding of decimals, and comparing and ordering different numbers as well. They can also work on converting fractions to decimals and vice versa. Most of the games focus on one specific subject, so students and teachers can choose games that meet the individual learning needs of each child. The games here are great for 5th grade students and provide just the right level of challenge for students of that age group - fostering learning by challenging their skills, but not frustrating them by asking them to solve equations beyond their ability.